There is a knock at the door. It is the police and they have come to take you house away from you. Civil forfeiture is a tool used by drug cops to generate huge revenue for sometimes-minor offenses including cultivation of marijuana. Maitland, Florida tried to take a residential property under the Florida Contraband Forfeiture Act. 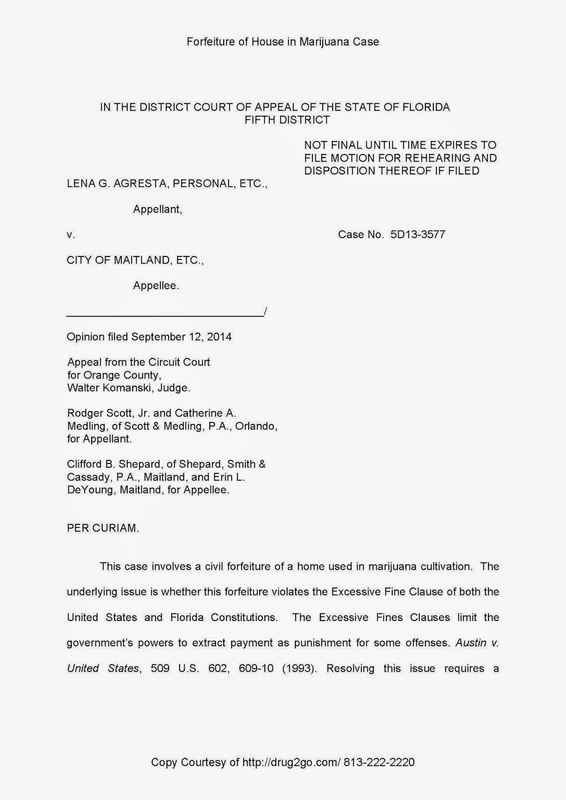 Florida owners fought back alleging and proving that the forfeiture violated the Excessive Fine Clause of the United States and Florida Constitutions. These constitutional clauses limit the power to extract payment as punishment for some offenses. A Florida man was charged with manufacture and sale of marijuana from a home. The homeowner negotiated a plea that included no prison, no jail, and had no forfeiture provisions in the agreed-upon disposition. The court also required 100 hours of community service. The city where the home was located decided to take the house anyway. Under many state and federal drug prosecutions the forfeiture of assets is addressed in negotiations with prosecutors or by juries in the criminal case. The home was worth nearly $300,000.00. The maximum fine in the case was $37,000.00. The plea agreement imposed no fine. You can get all the facts on this forfeiture case here by reading the Court ruling . State charges, state and federal plea agreements, and federal indictments can contain forfeiture provisions that read like this: Upon conviction for any of the allegations alleged in the indictment, punishable by more than one year, the defendant shall forfeit to the government any and all interest in property constituting or derived from any proceeds the defendant obtained directly or indirectly as a result of; and property used or intended to be used in any manner to commit or facilitate the commission of such violations. "Florida’s forfeiture provision also has a clear focus on the culpability of the owner (by providing an “innocent owner” exception), and because the legislature made an express finding that the Act serves to deter and to punish, it is also subject to the excessive fines limitation." "no case has been cited in which an appellate court has approved a forfeiture in excess of six times the maximum fine. We decline to be the first. Accordingly, we find the forfeiture in this case violates the Excessive Fine provision"
Forfeiture Defined Under Florida and Federal Law: forfeiture is used in a variety of cases in Florida's legal system both in State and United States District Court.